Cases related to the 2G spectrum allocation scam and black money stashed by Indian citizens in foreign banks in tax heavens are likely to be closely-followed in the Supreme Court in the week ahead. The on-going hearing on a plea against appointment of Central Vigilance Commissioner P.J. Thomas and a case related to Rajya Sabha member Amar Singh’s tapes would also figure prominently. On Thursday, the Central Bureau of Investigation (CBI) will submit its first status report on its investigations into the 2G spectrum scam. The CBI investigation is being monitored by the apex court bench of Justice G.S. Singhvi and Justice A.K. Ganguly. The court Dec 16, 2010 said that there was prima facie evidence pointing to acts of wrongdoing in the grant of second generation (2G) licences and grant of dual use technology prior to Oct 19, 2007 – much before the licences were officially allocated in 2008. The court had asked the investigating agency to submit its first status report in the case Feb 10. On Friday, the bench of Justice B. Sudershan Reddy and Justice S.S. Nijjar is likely to hear the petition by eminent jurist Ram Jethamalani seeking direction to the Central government to take steps to bring back the black money stashed away by Indian nationals in foreign banks based in tax havens. On Monday, the apex court would take forward the hearing on the petition by the Centre for Public Interest Litigation (CPIL) challenging Thomas’ appointment. An apex court bench of Chief Justice S.H. Kapadia, Justice K.S. Radhakrishnan and Justice Swatanter Kumar, during the last hearing, asked the central government whether Thomas could have been given a clean chit (by the then CVC) ignoring a pending chargesheet against him in Kerala’s palm oil import case of the 1990s. ‘Can the CVC say that let there be a high court judgment or observations, a pending charge sheet, sanction of prosecution (of Thomas) by the Kerala government, the report of the Comptroller and Auditor General (CAG) and that of the committee on public undertakings (of the state assembly) (but) I am not agreeing and (will) give a clean chit,’ the court asked. ‘When Thomas is made an accused (in the palm oil import case), then there is an application of mind by the (trial) court and the CVC can’t say that the application of mind (by the court) is of no consequence,’ the court observed. Earlier, the government told the court that there were ‘no guidelines or rules’ to prepare a panel of candidates before the selection of a CVC. Senior counsel K.K. Venugopal appearing for Thomas will resume his arguments. 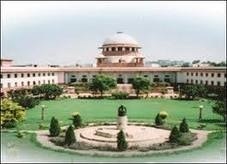 On Wednesday, the bench of Justice Singhvi and Justice Ganguly will hold further hearing on an application by the CPIL seeking a direction to make public the tapes of the intercepts of Rajya Sabha member Amar Singh’s telephones. It is alleged that Amar Singh’s phones were illegally tapped. The CPIL contended that everything that exposed the attempts to influence and manipulate the decision making process of the government should be made public. In the last hearing, the court pulled up the government, Delhi Police, a telecom operator and the MP for filing ‘very casual and vague’ affidavits and asked them to file these afresh in the former Samajwadi Party leader’s phone tapping case. The court asked Solicitor General Gopal Subramanium to file a status report on a case in trial court relating to criminal conspiracy in tapping Amar Singh’s phone. The court by its 2006 order stayed the publication of the Amar Singh’s tapes. The news report quoting an observation by the Apex Court On Wednesday last on an application by the CPIL seeking a direction to make public the tapes of the intercepts of Rajya Sabha member Amar Singh’s telephones, saying that the affidavits filed by Delhi Police, a telecom operator and the MP are ‘very casual and vague’ and asked them to file these afresh in the former Samajwadi Party leader’s phone tapping case. This gives us ample evidence of the standard of litigation carried on by the BAR at the level of Supreme Court dropping the garb of all decency, ethics and class of legal practice awaited at that level. This is a shame on the profession .